MARCO? Polo.....MARCO? Polo......AAHHH! FISH OUT OF WATER!!! Remember playing that game back in the halcyon days of our youth? 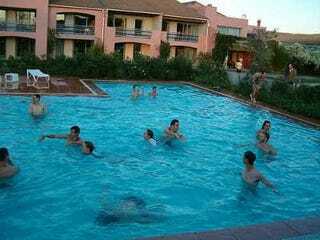 Everyone gets in the pool and one person, the one who is it, has to close their eyes and yell 'Marco'. Everyone else answers 'Polo'. And the person who was it had to catch one of the others, without opening their eyes. We called it the drowning game. We would always slowly drift towards the deep end, and as soon as it dropped off, let the 'Marco' get close before dashing to the deep end, trying to get them to suddenly go 'MARCOOGGLURGBB....'. Why it got named after Marco Polo I'll never know. I mean, the guy was a phony. A big fat phony! And that is our subject today. But first, let's pause for a moment to remember that terrible day 13 years ago. Let's hope we aren't on the path that will lead us to another attack. Sorry to bum you out so early with bad memories, but it's history, we all lived through it, and ignoring it won't make it go away. Marco Polo. We all know him as the Italian who went to China and brought back pasta and ice cream. Too bad he wasn't, and didn't. Marco Polo, which translates to 'Mark Chicken' in english, wasn't his name. He was born Marko Pili. And no, that doesn't sound Italian because it isn't. He was born on the island of Korcula, just off the Dalmatian coast. That made him Croatian. Those of you who know your history will say, "But, in 1254 when Marco, or whatever his name was, was born, Croatia was a protectorate of Venice!" And I'll tell you that fact is true. However, Venice is, and was, a city. Italy, as we know it, did not exist back in Polos time. It was a territory divided up and ruled by several city-states. Venice was one of them. You can't call Marco Polo Italian, because Italy didn't exist. And citizen ship isn't retroactive for historical figures. After all, Hammurabi is Babylonian, not Iraqi. You may technically be correct by calling him a Venetian, but not an Italian. Now, let's talk about pasta. The story goes that Polo brought pasta to Italy from China. The problem with that is, Marco never claimed to have brought past to Europe. Pasta was known in arabic countries as early as the ninth century. And recipes including dried macaroni were recorded in 1279. That's 25 years before Polo returned from his trip. So why do we believe Polo introduced us to pasta? A pasta trade journal in 1929 used the story as an advertisement to sell more pasta to stores. That's the first mention of Polo bringing us pasta. "Well," you say, "maybe he didn't give us pasta, but he absolutely brought us ice cream!" Doubtful. No one knows for sure who invented ice cream or when they invented it. But there's no mention of it in western literature until the seventeenth century. Considering how bonkers people are for ice cream, it's doubtful Polo brought a recipe to Europe. And that brings us to his trip to China. There is no doubt that the book, which was published in 1306, was a huge hit. But many of Polos contemporaries believed Polo was just relating tales he heard while working for his father and uncle. They owned a shop on the famed Silk Road. And many people back then, and today, think Polo never went east. The book it's self was written by a noted romance writer, Rustichello da Pisa. Polo dictated it to him, and da Pisa wrote it down in French, which Polo couldn't speak. So he couldn't verify the accuracy of what was being recorded. If we do a bit of simple math, we can find one striking fact that calls doubt about Marco's claim to have travelled to China: He supposedly returned in 1304, but as we just saw, in 1296 he was a prisoner of war. He could be including his time as a captive in the time he says he was in the east, but who knows? So, did Polo go east? Or did he just relate the stories he heard while working a Silk Road trading post on the Black Sea. I have to be honest; I don't really care. I just think it's a good subject for an oddities post. But you guys are the final judges of that.